Our courses are consistently rated 9.3 out of 10 on our feedback forms and 100% of all our clients say that they would use us again. This course is suitable for anyone interested in furthering their emergency aid skills, or takes part in an organised first aid scheme. For health care workers, this course serves as a basic module. The course covers how to use an automated external defibrillator. Treatment of an unconscious casualty. Getting to know the AED (any type). TMT UK now offer training 24hrs a day, 7 days a week. We will always try to match or beat any quote for first aid training. Please call 01684 773279 for an instant quote. 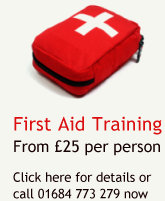 Free First Aid manuals for all courses booked before January 2014.